“We’re gonna get fit today!” The Master’s swim coach instructed enthusiastically from the pool deck just before the clock hit :00, and we started to swim. I had no idea what the workout was, the ladies in my lane were chatting while the coach, my coach, Hillary Biscay, was explaining the specific strokes we were meant to do during our warm-up, while pointing to numbers on a giant white board that was barely within my eyesight, (I am due to get my eyes checked), but none of that mattered, I was jacked up on fear-laced adrenaline and could’ve swam all day if instructed to do so, I just put my head down in the water, followed the swimmers in front of me, and pushed off from the wall. I had driven for nearly three hours that morning from my house north of Los Angeles, to enchanting Encinitas, a beach town just north of San Diego where Hillary coaches this Master’s session every Tuesday, in the pursuit of one objective, to swim the best I ever had, and then be critiqued on how I could swim better. That's me in the SFQ pink cap. The workout lasted a little over an hour, I think, real-world time felt out of reach; all that mattered to me were five second intervals that I counted on the hanging digital clock before it was my turn to send off from the wall after the lane mate in front of me. All I had to do was count to five. Honestly, the workout wasn’t as hard as I thought it would be. I think that is because I always swim alone, so I never benefit from swimming in someone’s draft, or swim with anyone’s company, but I think what really made the workout manageable, was that even though it was tough, it just seemed like any other workout, because nearly all of Hillary’s swim workouts are tough. 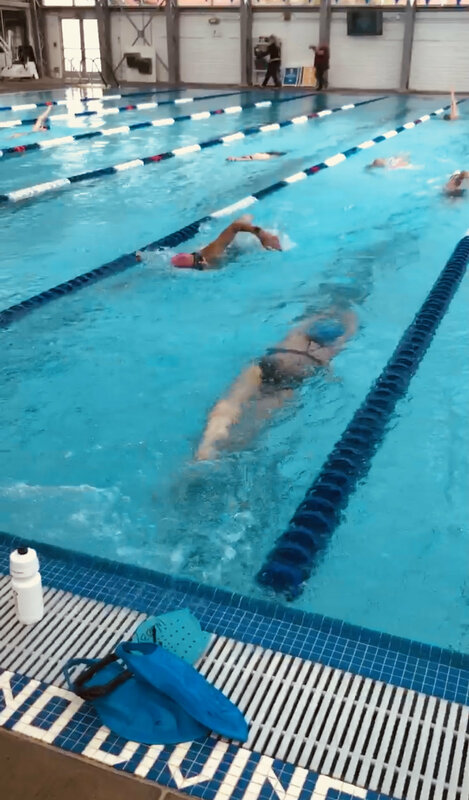 That is why she is a great coach, and I chose her as my coach, I want/need to improve my swim in order to be a better triathlete, and after receiving her feedback while standing next to her, dripping on the pool deck, I felt confident that even though there is plenty of room for improvement, I am moving in the right direction. The next stop that afternoon was visiting my sister, Mary, and her family a few miles inland from Encinitas, in serene San Marcos. Mary has two daughters, Darby, 5, and Teagan, 2.5, they are wonderful human beings, but are a handful and a half. 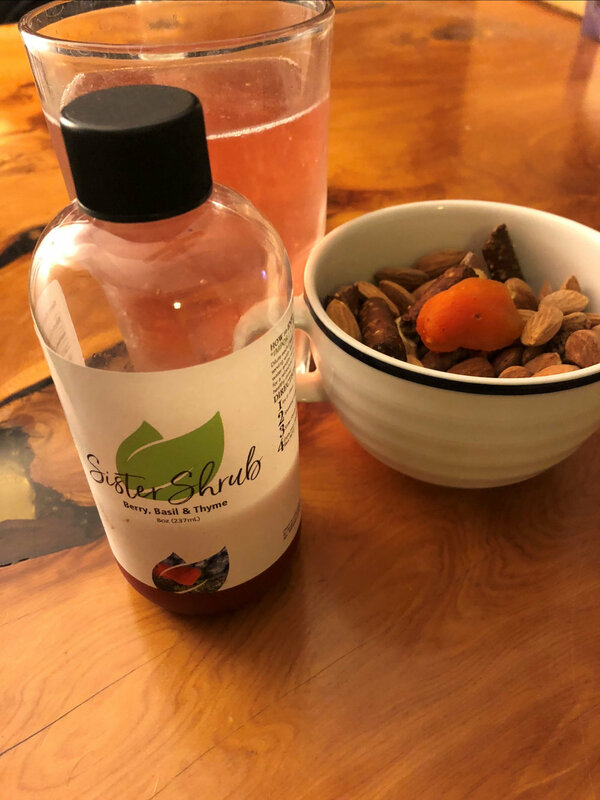 We spent the afternoon playing hide and go seek, drawing, and gardening, Mary has a real green thumb, and is a thriving entrepreneur as she is the founder and operator of the healthy, Apple Cider Vinegar infused tonic, Sister Shrub. I am so proud of all she is doing, and was thrilled when she asked me to be a part of a few photos for Sister Shrub. My standard Mocktail hour combo. There is nothing I love more in the world than making people laugh, but when that person is my big sister, my hero/frenemy since birth, that is the best feeling ever. Kelly and Heim sister bonding time. 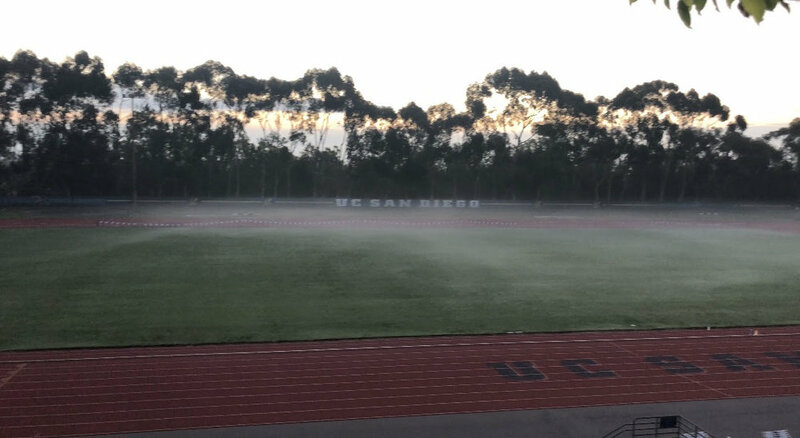 I woke up early Wednesday morning, and snuck out of Mary’s house without disturbing anyone’s slumber, (I hope), in order to drive thirty minutes south to UCSD, (University of California San Diego), to meet up with Hillary and another one of her athletes’, Alex Watt, for a track workout. UCSD Track, La Jolla, Ca. I was really looking forward to this workout. My coach, Hillary Biscay, and my teammate, Alex Watt. I saw Alex for the first time about a year and half ago when I watched her blaze by me on Imperial Beach during the second mile of the Superfrog, 70.3 triathlon. It was a moment that I felt more in awe than upset, because even though I never enjoy being passed during a race, the way she was running was spectacular, and not at all in my abilities, that I simply felt nothing but respect. Cut to, about a year ago, when I saw a post on social media from Hillary about cheering on her athlete, Alex, after she smashed the Encinitas half marathon, and I thought, “Wait a second, I know that girl.” Yep, it was the same Alex that blew by me on the beach and placed second at Superfrog, while I finished third. 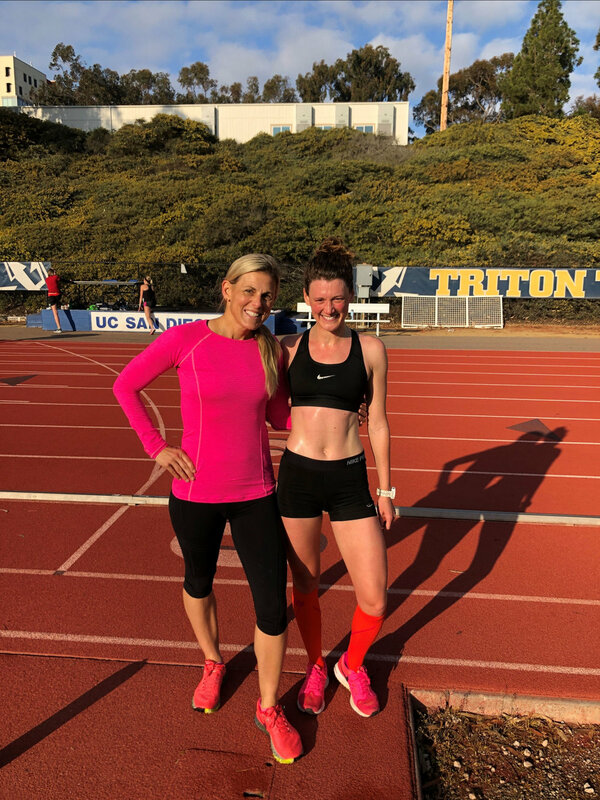 I was thrilled that Alex was now a teammate, (she beams positivity), and that an occasion like this, sharing a hard interval session with her while being coached by Hillary, would one day present itself; that day had arrived. Warm up laps. Photo courtesy of Hillary Biscay. Alex was at the Master’s swim too, but we were on opposite ends of the pool because the lanes are organized by average 100 yard speed, and um, our speeds are quite far apart. Think Pinto vs. Audi A5, and I am not the Audi. The track workout was hard, but fun. 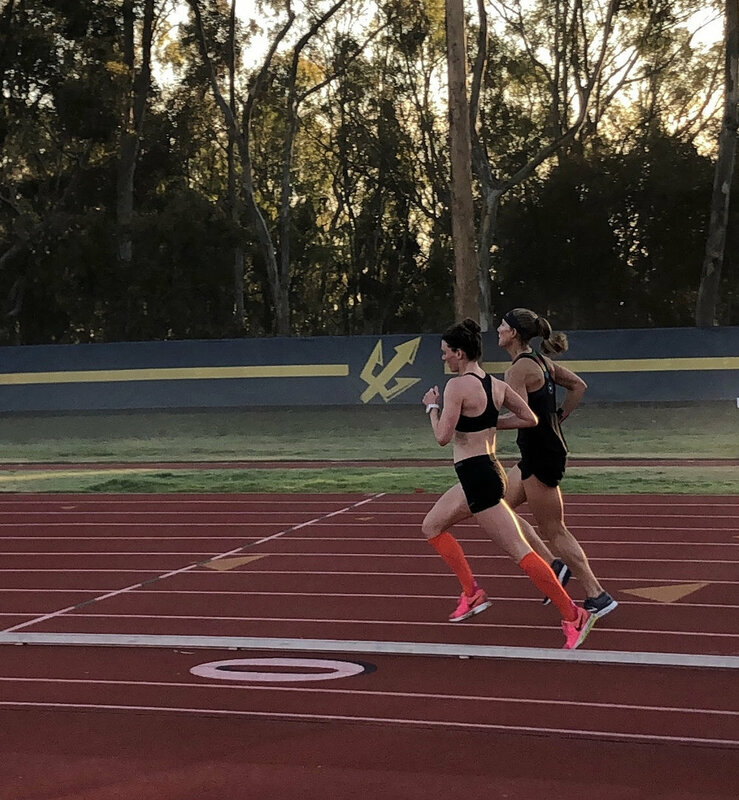 I love to run, and even though I was not right on Alex’s heels during the fast laps, (she is a former collegiate runner, a Champion age-group triathlete, and over a decade younger than me), my legs showed up, and I was happy with how they performed. Also, I have not had a coach closely look at my run form in years, so to have Hillary on hand in person was fantastic. She gave me great notes, helpful encouragement all morning, and exuded her unique energy that inspires so many athlete’s like myself to constantly dig deep and exceed expectations; ours and everyone else’s. As I was walking to my car, relieved that I had survived these two sessions that just twenty-fours before had made me quiver in nervous anticipation, I appreciated that Hillary was able to see me on both ends of the triathlon spectrum: weakness/swimming, and strength/running, and felt confident that I was driving away a better triathlete. Thursday morning started with a weeping, incessant drizzle that was annoying, but did not stop the fun. Post Breakthrough Swim, From left, my teammate's Kat Zeiler, Lynne fielder, and a tall lady. Photo courtesy of Jenn Aronson. 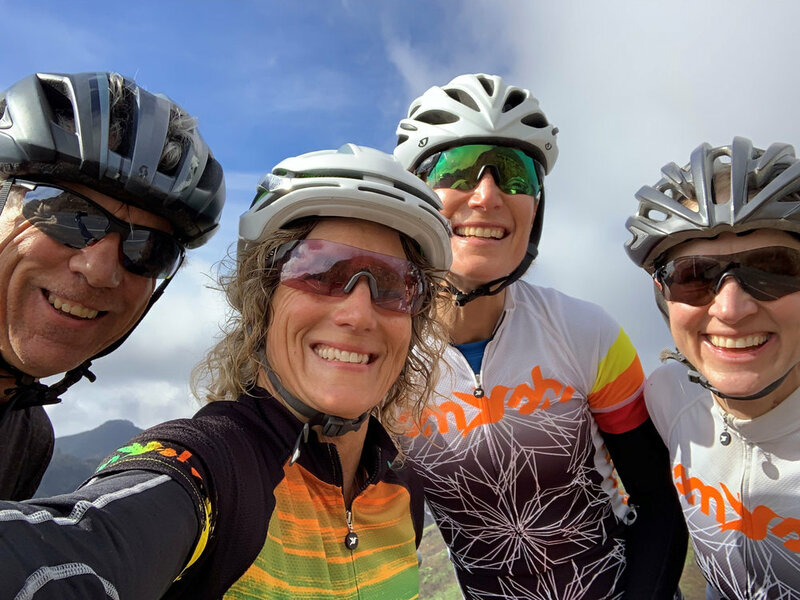 That’s right, I was back in LA training with my TeamHPB “Powerhouse Pedalers,” Kat and Lynne, for a challenging swim set in the pre-dawn hour, followed by hill repeats on the bike in an area of my favorite city that I had never seen, Mandeville canyon. The swim was great. The workout was a TeamHPB staple, and I swam it faster than ever before. #Progress. The ride, well, the ride was not so great. We rode all of the minutes and miles we were tasked to, but the sickly rain never let up. Instead of enjoying the gorgeous neighborhood within Mandeville Canyon, I just trudged up and down the hill soaked in precipitation, hoping my brakes would hold up to the slick surface of my rims and not make me crash. Still, it was awesome to share that loathsome adventure with Kat and Lynne, they were troopers per usual, and soon enough, I was off my bike, warming up in my car, and driving once again on the 405 freeway toward home. The last BIG day of “Humilty Camp,” Friday, started off with a bust. I was trapped in traffic en route to meeting Kat, Lynne, and our pal, Greg Stannard, for another long bike ride along PCH, and up and over my favorite of the Santa Monica mountain climbs, Latigo Canyon. Riding up Latigo. Photo courtesy of Greg Stannard. I thought I allowed enough of a buffer to beat the rush, but a stalled car on the 405 just before Mulholland Dr., and stopped all of us driving south in our tracks. I was forced to slowly crawl past the parked car like everyone else. I was about thirty minutes late to the ride, and embarrassed by tardiness, but just like the amazing people they are, my crew waited for me, and we spent the rest of the morning enjoying the sunshine, each other’s company, and breathtaking views found in this heavenly slice of California. My buds. :) From left, Greg, Lynne, Moi, and Kat. photo courtesy of Lynne Fiedler. When the ride was over, my day was not. I still had one more workout scheduled that sat in the back of my mind the entire five hours I was pedaling Simone, a tough sixty minute run workout was waiting for me back over the hill in the valley. I spent a few hours driving, resting and refueling before lacing up my running shoes and heading off toward my date with the trusty treadmill. I couldn’t have dreamt up a more fitting way to cap off such a momentous week. The training was immense, yes, I felt humbled and invigorated every other minute throughout the week, but what meant the most, what made the whole experience worth every drop of gas spent, and every pitch black wake up call inviting, was the people I shared it with. I am very lucky to have such incredible people in my life that share my grit, (teammates), support my drive, (my family), and understand my goals, (my coach), that I decided running that last workout well was my way of honoring all of them. This photo matches the header above, they were both taken moments after stepping off the treadmill.